Having read your blog for nearly a year and found it, at times, interesting, and occasionally, witty, you have at last stirred me enough to send you a mail. As a resident of Browning Avenue for two years (without sofa in garden or dangly christmas lights attached to house) I think you ought to look more carefully at your own street, and be reminded of the adage that people in glass houses etc etc. In my time in WP I must say that I haven't noticed that the residents of Brinkley were able to enjoy the trappings of an exclusive private gated street, and able to comfort themselves on the moral and snobbish high ground, but hey, you learn something new every day, lest you forget that Brinkley does actually join with Browning Avenue. It may also be of surprise to your 'esteemed' self that the stigmatisation of the WP 'yut' is a tad on the over-exuberant, they could be a lot worse. For one who blows the trumpet of WP and is quick to disparage those who wish to attach themselves to Cheam i.e Drill campaign of late, it would appear that, you are indeed sir, a hypocrite. Blog feed will be switched off in protest. Well, firstly, I don't live in Brinkley Avenue - I think you're confusing me with The Brinkster. And secondly I don't live in glass house (you have to weigh up the benefits of easy seed germination against the total loss of privacy) but the fact remains that yoof who gather in Browning Avenue do throw sufficient stones to warrant regular mentions in the Metropolitan Police Safer Neighbourhood Team's bulletins on crime and anti-social behaviour in Worcester Park. Granted, it is not on a par with the mean streets of Beirut but everything is relative. Besides, its inclusion was merely a suggestion on my part - it is up to the people of Worcester Park to decide which area of Worcester Park to banish forever. Should you feel that Browning Avenue is being unfairly picked on, then don't forget that The Hamptons are also in the running to be destroyed (so snobbery - inverted or otherwise - plays nor part in the inclusion in the poll). To your final point, I don't believe that blowing the trumpet of Worcester Park to be in any way incompatible with disparaging its less salubrious parts. But credit where credit is due - that you took the time to e-mail in defence of Browning Avenue is noted and appreciated. 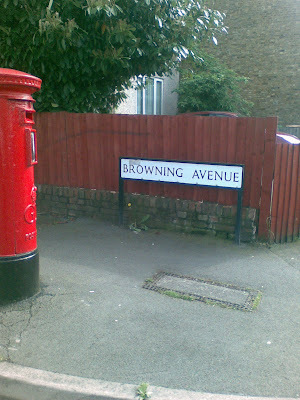 Now it's over to the people of Worcester Park to decide on the fate of Browning Avenue. P.S: Am I really only at times interesting and occasionally witty? I hang my head in shame. P.P.S: If I am only occasionally interesting and witty, what kept you reading the blog for a year?